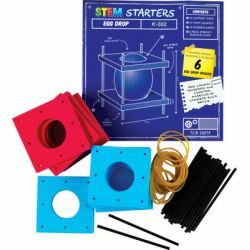 This activity kit challenges students to create a device that can protect an egg when dropped from an elevated position. The essential pieces, foam squares, a rubber bands, and plastic support rods, are provided; it's up to the young scientists to determine the best materials to use in order to protect their egg. Using the engineering design process students will create, evaluate, and redesign their simple structure until their objective is met. Includes enough materials to begin 6 egg drop devices. 60 pieces total.